Following on from this thread, do any of you more experienced dehydrators fancy sharing the details of what you do with a view to getting an article together? I've been drying produce nearly every day since the start of July and trying to keep records of what I've done and how it turned out but I know there are people on here who have years of experience. To get the ball rolling, here's what I've been doing. I've got a 9 tray Excalibur dehydrator. We're off-grid and so it's powered by our PV system. Both the PV system and the dehydrator are new, so I only have it running during the day to make sure I don't run down the batteries. We've got one of those power monitor gizmos that goes between the plug and the socket and I've been trying to record as many power usage details as I can. There are some on the previously mentioned thread and I'll post a spreadsheet here with figures once I've finished it. I'll only be able to run it during the summer months when we have an "excess" of solar i.e. extra once the batteries are charged. We didn't get the PV system set up until July, hence the late start date, so I missed drying any rhubarb and blue honeysuckle and I think I might have to stop using it before the apples are ready. ...for example, at the moment if I make jam I have to use bottled gas and add bought in sugar, so for us, drying is a cheaper, less time consuming method of preservation with a more flexible end product - you can eat dried fruit as it is, rehydrate it, add it to cooking food but jam is just jam. Dried veg takes up very little room in jars and should be as convenient to add to dishes as frozen veg, without taking up freezer space (and using electricity in winter when we might not have enough as well as the risk of defrosting and losing all our produce). Shallots - the green tops dried quickly and kept their bright colour. Carrots - used a SpinSlicer gadget to thinly slice them into spirals, worked well. Sweeter dried than raw. Beetroot - spirals as for carrots. Very earthy smelling once dry. Garlic - thinly sliced, dried rock hard. Cucumber - thinly sliced. Dried tastes salty as celery does. Kale - cut into strips. Dries quickly and keeps good colour. Young leaves are not too cabbagey. Will use the veg to make Cup-A-Soup or in cooking this winter. Gooseberries - halved. Chewy texture but nice and tart! A bit more-ish. Redcurrants - halved - rock hard and unpalatable - too seedy. Checked (poured boiling water over to break skin) also hard and unpalatable. Drying too long? Blackcurrants - checked, nicer than redcurrants as less pippy. Would be nice sprinkled on icecream. Blueberries - halved. Nice but a bit bland, could be variety or not ripe enough. Strawberries - thinly sliced. Wow! The jar is full of wonderful strawberry aroma and the pieces are crispy and very tasty. Amelanchier - more seed than flesh. Would be better as part of a fruit leather. Berberis berries - quite savoury. Use in a salad? Gooseberry and apple (frozen) - sharp, should have moulied gooseberries to remove pips. Basil - took a very long time to dry as temperature low to preserve flavour. Celery - the Cup-A-Soup type recipe in Mary Bell's book used celery and I can see why as it's salty and flavoursome once dried. I'm going to pulverise it and try the recipe. I've mostly been following Mary Bell's Complete Dehydrator Cookbook as it gives water content values and tips on how to prepare items for drying. Meat and Fish - 145 degF and above. I did the jerky at 155 - as high as it would go. Fruit and Veg - 130 to 140 degF. I've tended to do root veg higher (140 to 145) and fruit and more delicate veg lower (130 to 135). Herbs and Flowers - 100 to 110 degF. 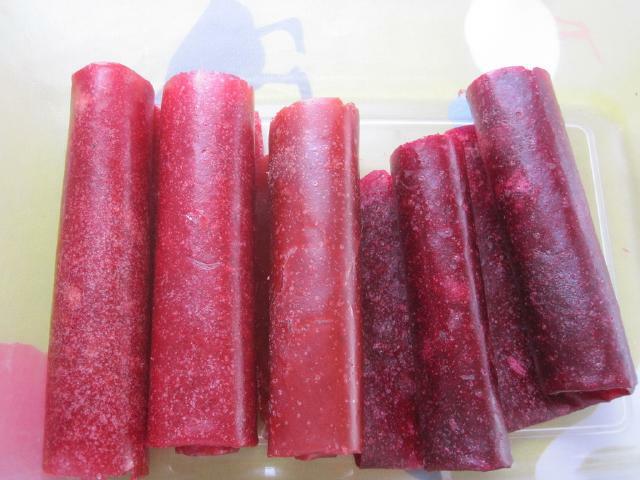 Prepare by slicing thinly, halving or in the case of fruit leathers, lightly cooking and pureeing. Fruit with seeds can be passed through a mouli and it is worth it as the end result is much nicer to eat without all the seeds. Fruit with waxy skins can be 'checked' - pouring boiling water over or immersing them briefly to disrupt waxy coating and allow quicker drying. I tried blackcurrants without doing this and they took forever to dry and separated to have an unpleasant papery outer coat. The checked one are much nicer. I started off by checking it against the expected figures given by Mary Bell but you do quickly get the knack of telling whether the item is dry yet. Fruit goes rattley, veg crisp or crunchy and herbs and flowers crisp. Leather goes, um, leathery. You should test it when it has cooled as warm items appear less dry than they are. I leave the dried items in a large sealed plastic box overnight, to cool thoroughly then put them into kilner or screw-top jars the next day. The best success so far has to be the strawberries and next year I'll try to dry lots. Halved gooseberries are like sweets and everyone I've tried them on has agreed. The fruit leathers have also been a nice surprise but I need to adjust the recipes to stop them all tasting appley. 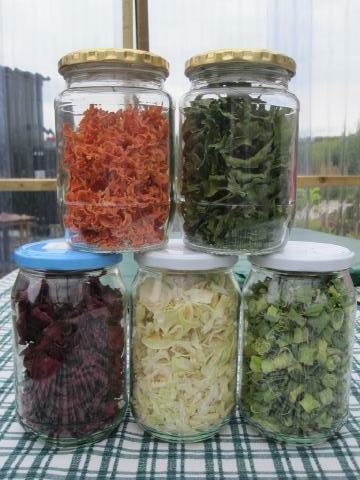 The dried veg all looks great in their jars and I'm looking forward to trying to make instant soup with them. I've now got a range of herbs for cooking and for teas for the winter and I'm particularly pleased with the elderflowers. Failures - I've not had great success with small berries even when checked. I think I'd be better off putting them into leathers. The radishes are ok, but nothing to write home about. This season, I'm hoping I'll have time to try cherry plums halved, apple rings and chokeberries halved and made into leather. I've got bilberries in the freezer I'd like to make into leather, probably with apple and my tomatoes are just ripening so I'd like to try to powder them to use in cooking. In Creating a Forest Garden, Martin Crawford gives ideas of how to deal with some of the more unusual fruit eg. Elaeagnus so if I get a big enough crop this year, I'd like to give that a go. So would anyone like to share their successes, failures and top tips for dehydrating their produce? And can anyone tell me the best way of dealing with redcurrants, please? Does anyone use a solar dehydrator or a home-made drier? That's great Cassy! Thank you! Can you (or anyone else) post a picture or two? Then we'll get it added to the articles. Oooh, please don't make it into an article yet. I think we need feedback and info from the people who have more experience than me - I might be doing it all wrong. I will take some pictures though. My dehydrating is all in the sun, but I have the advantage of a lot of summer sun! I don't bother doing big quantities of most veggies any more, as I found I still had half used jars left the following year, but I regularly do tomatoes, peppers, chillies, various green stuff (the greens from carrots, fat hen, cabbage ...), various teas (mint, chamomile, elderflower ...) and all sorts of fruits. I've never got round to drying garlic, but I really mean to. I tend to keep jars of chopped dry veg by the cooker (aubergine, pumpkin, courgette, peppers ...), and just bung in handfuls as I cook. If the veg is chopped small enough it doesn't need pre-rehydrating. I've found that dried pumpkin makes a crispy nice snack, courgettes dry best in thin rounds strung with thread on the washing line, and that drying greens then crumbling them into food so they look like mixed herbs is a cunning way of sneaking greens into kids. I've found that dried fruits give a far better effect than fresh when flavouring liqueurs. Which is a great way of using small quantities. I dry fruit for baking, and to give to the kids for school snacks. However, I scoff much of it myself whilst pottering around the kitchen, which I don't think is a bad use for it. Dried blackberries can be chucked into a fruit crumble made with fresh fruit and will rehydrate nicely during cooking. The best use of my electric dehydrator, when I had the electricity to use it, was drying pears and apples I used to be able to buy as 'animal feed' for a euro a crate during the winter months, and for finishing off glace fruits which made excellent presents. So many interesting points there! How do you do your tomatoes - halved, sliced, pureed? Dried veg sounds like a great way of getting extra veg into meals with little effort. I'll give liqueurs with dried fruit a try, thanks. Whatever takes my fancy / suits the tomatoes! This year I've got lots of plum tomatoes, which I'm quartering lengthways. Makes nice pieces visually actually. Piccies of those too? We can meld it all together into a article with multiple authors. Never mind - it just all sounded very striking - the description is great anyway. Redcurrant and apple fruit leather, just poured. Jars of dried veg (clockwise from top left) - carrots, kale, shallot tops, shallots, beetroot. Aren't they pretty? Do the colours stay bright? Beautiful pictures Cassy. Your strawberries look a million times better than mine. You do get better looking results using an electric dehydrator. 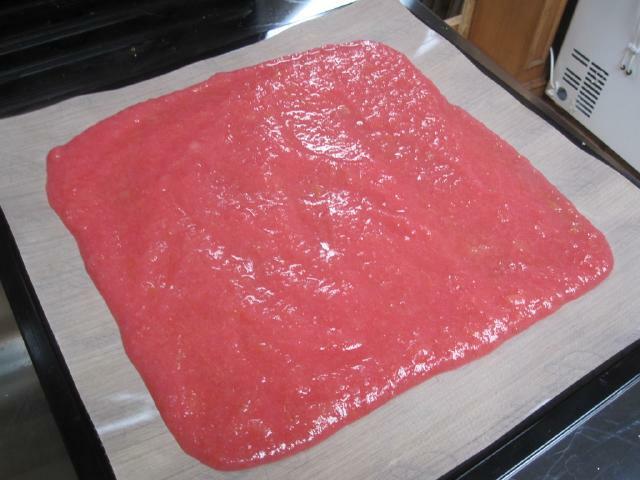 Try making thin tomato puree leather. Then use it in casseroles etc. It melts into the other food and delivers a very concentrated tomato kick. One of the best fruit to dehydrate is pineapple slices. Forgot to add ... puree garlic first. Then dehydrate into thin bits. Whizz into a powder. Much more usable than 'bullet-hard' garlic chunks. Also, try smoking food before you dehydrate it. Try dehydrated smoked salmon! It turns into a crispy jerky. I dehydrate and powder celery for use as salt. Will try cucumber as well. Pureed bananas into leather is weird. I whizzed one batch and I think it introduced a load of air so the leather had a very light texture, almost like sheets of blotting paper, but with a banana taste. Oh .. strawberry and mint leather is nice.